The tension mounts. The clock seems to be ticking faster and faster. With dried throats and unblinking eyes, the victims stand shoulder to shoulder, dreading the moment of reckoning. The guard at the door leers unpleasantly at the helpless faces gathered just outside the gate. No, this is not the scene outside a concentration camp. Nor is it a scene from just outside a Qurbani-r Hut. 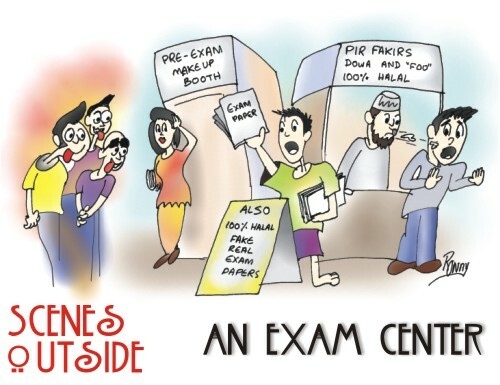 Ladies and gentlemen, here we present to you: the scenes outside an exam center! In a quiet corner of their own are the Hermione's and Einstein's, exchanging last moment tips on how to tackle section 2 of paper 1 and so on. Some are double, triple and quadruple checking to make sure they have extra pen and pencil, eraser and sharpeners, a nice clean handkerchief and a host of other stuff integral to properly taking an exam. Every now and then a few of them check whether the gates have been opened, prepared to run for it the moment they are allowed to. On the other side of the road are the carefree cool dudes. No way to tell that these guys have an exam in less than an hour. They are engrossed in gossip about sports, music, movies and in general anything that will keep their minds off the unpleasant business at hand. Why bother about something now when you have refused to bother about it over the past year or so? Some of the cool dudes, however, are not taking part in the gossip. They are using their reserves of energy to catch the eyes of a certain other group: the powder parade. These are the girls caught up in an animated conversation about their make-up, hairstyle and dress. They are as apprehensive about looking good for the exam as other people are about actually doing well on the exam. After all, this silly exam ends in a few hours, but the make-up and accessories will be with them for as long as they choose: which is to say, forever. The most active people, by far, are the crammers. Anxious to learn in two days what several others have mastered in almost two years, they run from one person to another, obtaining answers to commonly asked questions and clarifying techniques to prove common theorems. All the energy they saved by not studying ahead is finally put to good use as they run back and forth, trying to learn from others stuff that they could easily have learnt by themselves had they ever opened those paper things called books. Well, that was all about the students. But for every student present in the venue, there are usually two parents accompanying them. Hence it would not be fair to end a discussion of the matter without as much a mention of the parents, would it? So let us now focus on what the parents are doing while their kids are getting ready (or not) for the exam. First we have the praying parents - muttering suras one after another, and not letting the kids have one last look at the books and notes, constantly bugging them with their foos and tabiz and who knows what else. This display of faith is not by any means limited to their own children, but is also extended to friends, other family members taking an exam and in general who is within reach. Then we have the powder parents (any links with the powder parade mentioned above not confirmed). Their philosophy is: "Well, OK, the kids have an exam! The ten private tutors and the huge new school building took care of that! So why bother? Now is the time to show off the new sarees and suits and cars and cell phones. The kids can take care of themselves, (or not) but the opportunity to show off all these goodies does not come every day. Ah, if only the kids had more exams!" The most noticeable kind, however, would have to be the nervous wrecks. They sit on the sidewalk, or pace to and fro the gate, sweating and complaining about how they should let the students in, and that it takes time to settle down and adjust oneself for the exam, and so on. They are often more nervous than all the actual candidates combined, and make the whole scenario all the more stressful for those poor souls. The indifference of the last category, and the over-zealousness of this one, can be equally disconcerting for their children, although neither type of parents ever seems to realize this. However, no one else can ever match the irresponsibility and the insensitivity of the type of parents that use this meeting of parents as a stage for a game of one-upmanship. "Your kid is taking 8 subjects? Oh, mine is doing just 12! He wanted to do some more, but poor dear hardly had any time left after the piano lessons, French lessons, cooking lessons and eating lessons." "Yeah, I know…ECA matters so much these days! My daughter has been working for the RS as contributor extraordinaire! She gets more hate mails than anybody else on the team!" A third one pokes in, "RS? Yeah, yeah, that's where my son gave an interview last month, him with his band you know…the Screaming Fools!" Amidst all this chatter and animated movements, finally the hour arrives. The gate opens, and people rush in with an eagerness suggesting that getting to the exam hall first is part of the actual exam. As the young ones go in, one by one, the parents look on. With the last person inside, the gates are closed, to be opened after the exam. Till then, the parents will wait with their fingers crossed, and the students will be busy with their question papers. We all hope it turns out good for them, no matter which group of people they belong to. All the best to all exam candidates everywhere!